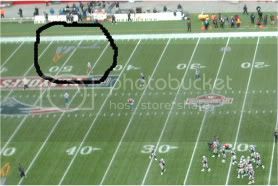 What is the symbol on the field....directly above the Patriots logo? It's the Gillette Stadium logo. The easiest way to describe it is that it's a bridge (the longer, low part) and then the A shape form is a lighthouse, which is how the stadium is designed. Gillette must've paid a pretty penny to have the logo on the 50 yard line. No one else has the stadium logo on the 50, or on the field for that matter. It's not the Gillette logo, it's the "gillette stadium" logo.